Reliable low stress clock type springs. Sealed, non-breathing housing protects spring in corrosive environments. Available in models 05 to 18 (excluding 15). Mid position can be set mechanically anywhere in the actuator’s travel range using ‘vernier’ type scale. Self contained spring assembly which can be easily removed without a keeper plate. Can be used in aggressive or hazardous environments without the need for complex or sensitive instruments. Can be fitted with high temperature seal option for up to 100°C. 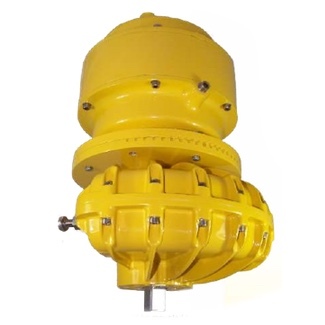 A patented part-turn rotary actuator that is driven to an end stop, in either direction, from an initial center position and is spring returned to an accurate and positive mid point when the air supply is removed. The mid-position can be set mechanically anywhere in the actuator’s travel range. The spring to center assemblies consist of one double acting actuator fitted with two or more opposing clock type springs contained within a single housing. Controlled with a dual coil, 5/3 solenoid valve (or two 3/2 single coil valves) which, when totally de-energized, allow the springs to precisely center the actuator against physical stops. When either coil is energized the actuator will travel towards one of its end stops. As the vane moves towards an end stop the air stroke torque reduces as the spring torque increases and vice versa. When the coil is de- energized the vane will spring return to its original center position. The usual ‘center’ position will be in the middle of the actuator’s 0 - 90 degree travel, but this can easily be adjusted to any mid-stroke location. A vernier scale on the adjustable plate (see attached picture) permits precise mid- position setting to within 1 degree.